Tata Camelot�s ambitious plan to raise skyscrapers in the vicinity of Sukhna Lake has run into another legal hurdle. Taking up the Save Sukhna case, a Division Bench of the Punjab and Haryana High Court today directed Punjab, Haryana and the Chandigarh Administration to not just stop construction activity in the lake�s catchment area, but also demolish, without notice, any construction being carried out against the high court mandate. Thirteen Indian pilgrims were among 15 persons killed today when a small plane with 21 persons on board crashed in northern Nepal after hitting a hill top while attempting to land at a high-altitude airport. It is Haryana�s hall of shame. Days after minors were found to have been sexually abused by a caretaker at a Gurgaon shelter home, the case of a state-recognised institution in Rohtak has come to the fore, breaking previous records of child rights violations in the state. 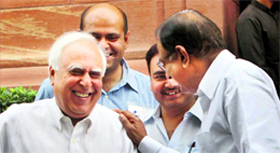 Union Human Resources Development Minister Kapil Sibal today promised to Parliament to �put in place a suitable process� to prevent recurrence of denigration of national leaders and politicians in cartoons in NCERT textbooks. Maldives President Mohamed Waheed today assured India that he would do nothing to hurt the special relationship between the two countries even as he virtually ruled out early elections in the Indian Ocean archipelago. There was no proposal to have a defence cooperation pact between China and the Maldives. Stop, look, and go, seems to be the new mantra on the busy roads of Srinagar. When five traffic signals were made functional in Srinagar almost a week ago, the traffic police department didn�t expect wonders. But now those manning the traffic in the summer capital claim that a large number of residents were following these signals.